Homecoming: Tell us a little bit about your musical background and how you developed a love for music. Tim Duncan: I’m originally from Mississippi, and I started out as a bricklayer—I laid brick for about 15 years. But I always had a desire to sing … I was the first one to volunteer if they asked if someone wanted to sing in Sunday school. So that was in me from the very beginning. I was raised Pentecostal, and we didn’t have a TV in our home until I was around 18, but my dad would buy quartet records. I would listen to those records, because that’s just about all I had to do, especially in the wintertime. But I fell in love with that four-part harmony—the bass going low, the tenor going high, the long endings and the tight harmonies. So it all started from there, and from a young age, I said, “I’m going to sing in a quartet.” At first, I wanted to sing tenor! HC: Was your family musical as well, or did they just have an appreciation for music? Tim: Well, I was raised in church and my mom and I sang in church, so my musical background was mainly from singing there. But I would listen to those records, as I said, and that desire to sing in a quartet never left me. The church was having refreshments one night, when I was about 17, and the sound system and microphone was left on. So a few of my friends were going to sing “Amazing Grace,” and they said, “Boy, it’d be good if we had a bass singer.” And I said, “Well, I’ll sing bass”—I didn’t have a clue of anything, as far as singing bass. But boy, those tones just felt right, and I thought wow, I can do this. My dad always had a low voice—he didn’t sing, but his speaking voice was low. I got a little quartet going at the church, and I dug out all the Gold City, Cathedrals, Kingsmen, all those songs I wanted to sing. But for my first professional job, I was making $350 a week, singing on the weekends, and I thought I had arrived. I didn’t have to lay brick every day, you know? That group was a local Mississippi quartet called Safe Harbor, but it’s not the Southern Gospel group known by the same name today. I sang with them for about two years when I was in my early 20s, and I had to drive two and a half hours for practice. My wife would bring soap and shampoo to me on the job, and I’d go around back and take a little shower, then I would drive to practice. Then I got a job with Master’s Voice and sang with them for about two years. After that, I got a call from my friend Gene McDonald, who said Phil Cross from Poet Voices was looking for a bass singer. So I got that job and sang with them for about three years. Then, when that group disbanded, one of my buddies called and said Ernie Haase was putting a group together. I got that job, and I sang with Ernie Haase & Signature Sound for eight years. It opened up doors, and the biggest thing that ever happened in my career was when Bill Gaither took on Signature Sound. 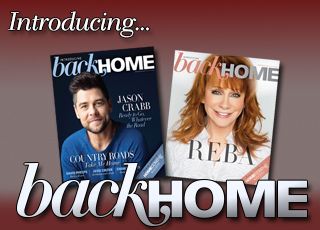 We got on several of the Homecoming shows, and did the record with the Gaither Vocal Band. 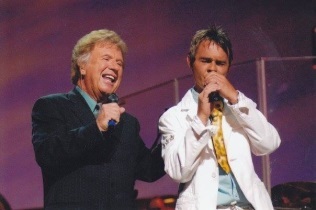 Bill Gaither has helped so many people, including me, and without him, a lot of people might not know who I am. So that was a good boost in my career, getting to sing on stage with Bill and the Homecoming artists. Anyway, after eight years, the time came for me to leave Signature Sound. I was at the video shoot for the last Homecoming video I did, at the Billy Graham Library. Michael Sykes was with Canton Junction at the time, and he told me that they had been singing as a trio at Pastor Hagee’s church, but that they were interested in getting a bass singer. So I went down to Texas, and loved what was going on down there. I joined, and it’s been going strong for four years. I love my job, and the best thing about it is that I’m not on the road full-time, so I’ve got a lot of quality family time. But we do go out and do Pastor Hagee’s crusades, and sing at the church. HC: How are you enjoying the new blend, since Casey [Rivers] and Ryan [Seaton] have joined Canton Junction? Tim: I sang with Ryan, of course, in Signature Sound, so I knew what kind of singer he is. He’s what I call a “legitimate lead singer.” There are a lot of great singers, but it takes something extra to be a quartet lead singer. I don’t think he’s under the title of “lead” singer [with this quartet] … sometimes Ryan sings baritone, sometimes Casey does. I guess if you want to put a label on it, Ryan is the baritone singer, but he sings a lot of lead parts. 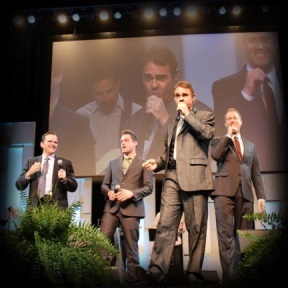 But I’m excited about the new blend … Casey and Ryan are both great singers, and Matt is a great quartet tenor. Like I said, there are good singers, but then there are singers who know how to blend, and he knows how to finish the song with that high note. HC: If you can pinpoint anything, what would you say has been one of your best moments with Canton Junction? Does anything stand out? Tim: Well, I couldn’t say one high point, but we've visited Israel, and some of our time there has been really memorable and fun. Otherwise ... just being able to sing at the church, since it’s televised to people all over the world. I love singing with Canton Junction and I love the guys, so I’m just in a good spot right now. HC: If someone were coming to see Canton Junction for the first time, what should they expect? Tim: Well, they would hear great quartet singing, and they may laugh, they may cry … We have some tender moments, some funny moments. We’d just take them on a roller-coaster ride. We have fun songs, we have songs that run deep and will touch your heart … a big variety. HC: Do fans express to you how the music touches their lives? Tim: Yeah, there are a lot of people who come to the record table and say, “I was going through something, and that one particular song just really helped me.” You know, we’re spreading the gospel. While we’re singing, you can look out into the crowd and you can tell when a certain line or lyric touches people. One thing we try to do when we pick out our material is to get good, deep stuff that will help people in everyday life. People go through stuff all the time … even me. There are songs that we’ve recorded … when I’m feeling kind of down and listening to those songs and keying into the lyrics, I get something out of it and it helps. And I know if the songs help me in day-to-day life or trouble that you’re going through, I know they help people. 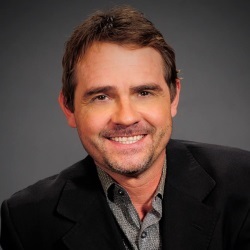 Tim: Well, Garry Jones is our arranger and producer. He produced for Gold City for about 13 years, and he has a lot of connections, a lot of great songwriters he can go to for songs. Then he brings songs to us and we listen to them together. We had a list of about 20 songs, and we tried to pick out the best ones for this album. But we are lucky to have Garry—he’s a great producer and arranger, and he was able to bring several great songs to the table. HC: What are a few of your favorite Canton Junction songs? From Every Hallelujah, one song that comes to mind is “I Need a Little More Jesus.” It’s an up-tempo song, and it’s a lot of fun. And “It Wasn’t Raining” is one of my features that talks about how it wasn’t raining when Noah built the ark. I didn’t know it, but Noah preached for 100 years, saying “It’s gonna rain, it’s gonna rain” [and hearing] “Why are you building that boat?” You know, we hear that story as a kid and don’t realize that he preached for 100 years that it was gonna rain. And “A Place called Grace” is one of my favorites, and then “God’s Got a Better Plan,” which was written by Ronny Hinson. There’s a line in there that says Sometimes God don’t finish what you start, because God’s got a better plan. He’s seeing the big picture. HC: Were there any stand-out moments during the recording process itself? Tim: Well, we just try to have fun in the studio, without a lot of pressure. I’ve done recordings before when there was so much pressure, but we keep it kind of lighthearted. Of course, there were some brand-new songs and you’re reading the lyrics off of a sheet, but Garry Jones makes it easy in the studio. We had a lot of fun with this recording. HC: That's great. Changing the subject, we'd love to hear a little bit about your family. 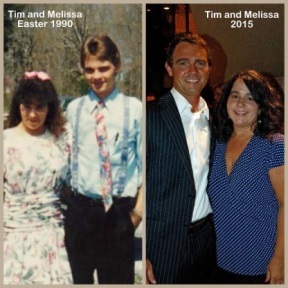 How did you and your wife Melissa meet? We’ve been married for 24 years now, and we live in Gallatin, Tennessee. We have two boys—Breck, 22, and Brandon, 21. Brandon is going to school, majoring in music, and he plays piano. And Breck is working; he has a job helping a bricklayer. HC: How have you and Melissa found balance through the years, with all of your traveling? Tim: Back in the day, when I was on the road full-time, I’d be gone Thursday through Sunday. It’s a lifestyle that you have to get used to, but she supported me from day one with my singing. 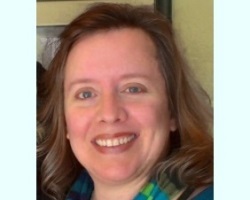 She was the one who would kind of push me and say, "Call this person … call this person! You’ll never know unless you call.” She’s always been behind me. Now, I get to stay home more, and at first, she was like, “Well, I’m not so sure about this.” (laughs) But now, she told me recently that she’s used to me being off more. I try to get things done … I change the oil in the car and do this or that, because I’ve got time to do it. HC: What are some of your favorite ways to spend time when you’re at home? Tim: Well, I like to fish. And since I was a bricklayer for 15 years, I go out and help a bricklayer once in a while. I love doing it; I don’t do it all the time, but when I’m off for a few days, I enjoy it. HC: One more question: As an artist, what would you say is your mission? Tim: To make a living with my God-given talent and to spread the gospel. Like I said, when I’m up on stage and I can see that we’re touching people, I think that’s my mission. I’m going to use my God-given talent to the best of my ability and as much as I can. I think I’ll sing the rest of my life.